The Spirit | Ghost (S|G) project explores the field of educational spaces and specifically the creation of an environment that can best suit different types of teaching methods, while maintaining key characteristics for human activity. The project aims to provide an operational paradigm as it demonstrates a space that integrates IT systems to assist in the efficiency of the educational process. The sensponsive operation is divided in two main phases. The first one, dubbed Spirit, monitors the human activities within space, identifies their context and evaluates the existing spatial configuration in terms of hosting and facilitating them, providing it that way with the element of sense (logos). Spirit has a mission to comprehend, not to engage in a reaction. If there is cause for intervention, the second phase, dubbed Ghost, takes place with active spatial and environmental changes. The concept of animism provided us with the psychological context in which people react positively within a sentient changing environment, as well as with the theoretical framework to develop specific human-computer interaction protocols. It also influenced the name of the project. The S|G research framework is currently under the fifth stage of its development. Each stage has a specific research goal to accomplish, resolving issues toward the construction of a full-functional prototype in the future. The first, simplified study model involved a university classroom with a simple geometry (a square), one parameter to monitor (crowd density), one spatial change (linear displacement of a partition), and a simple behaviour (to increase available surface if overcrowding persists). The observations were based on two models, one virtual created in Grasshopper, and one real, created with plexiglass and plastic corrugated board, that was equipped with sensors, motors and an Arduino controller. The ‘bridge’ between the two models was Firefly. The second study model was a more complex one, still though examining an enclosed, defined learning space. The goal was to develop Spirit, the activity recognition system that would also have the ability to verify its findings. The following factors were monitored to assess the type of activity (lecture, workshop, study or free time) within the given area: (1) Temperature, (2) Sound, (3) Proxemics 1 / personal space, (4) Proxemics 2 / people, (5) Positioning, (6) Analysis of movement in vectors. The linked working environments were Rhino – Grasshopper – Firefly – Actual Interactive Setting. Fiducial markers acted as people for the image recognition via reacTIVision. In this experiment, the system successfully recognized the four types of educational activities set. The third stage of this research project moved into the Ghost phase, through a new intermediate study model. The aim of S|G 03 was twofold: a) to establish an immediate connection between decision maker (designer, user) and spatial arrangement, via a design platform that can control directly the physical environment, and b) to examine one possible response and adjust the spatial conditions to accommodate the changing needs of the educational activity identified earlier. For the purposes of this stage, the project was oriented toward optimizing the activity of lecture. Initially, we analyzed the optimal spatial characteristics for the different types of lectures, then experimented with different typologies of spaces, investigated techniques for application in existing rooms with minimal deviation from the starting phase (common rectangular typology), and finally, developed an “esoskeleton” to hold the interior wall-covering that was comprised of a custom-designed fabric. The sensponsive system exhibited the following modes of operation: the interactive and the sensponsive. The linked working environments were Rhino – Grasshopper – Firefly – Actual Interactive Setting based on the Arduino Uno microcontrollers. The team also worked with Intel's Galileo microcontrollers, in a later phase, to evaluate differences. Spirit|Ghost 04 moved on to provide more detail toward the implementation of the system in actual classrooms, focusing upon two different phases of the logic diagram and operation of the project. It analyses and clarifies the specific parameters and characteristics that have the most significant impact on the spatial quality of the lecturing environment: geometry, color and lighting, acoustics and ventilation. More over, it addresses the way in which these parameters respond to each one of the different lecturing activities (lecture, discussion, presentation, board and debate) as well as in the sensponsive operation. After collecting the aforementioned data, we have a clear vision of the general specifications of the structure, its components, as well as its geometry and material composition. The current structural logic of the scaled model provides all the potential to proceed with the desired and necessary changes for the optimization of the spatial quality. The model consists of three main parts: the floor platform, the ceiling infrastructure and the flexible surface that forms the sidewalls and the ceiling. The dimensions of the model follow the standard lecture rooms in most university facilities. The linked working environments are Rhino – Grasshopper – Firefly – Actual Interactive Setting, based initially on the Arduino Uno and Due microcontrollers. In the final phase of the complete systems integration the working environment is based on Intel's Galileo microcontrollers to control the surface's reformations, while Arduino Uno is used to control the adjustable floors. Oungrinis, K.-A. and Liapi, M. (2014). Spatial elements imbued with cognition: A possible step toward the "Architecture Machine." International Journal of Architectural Computing (IJAC) 4(12), Multi-Science Publishing, 419-438. Oungrinis, K.-A., Liapi, M., Georgoulakis, S., Mairopoulos, D., Lionaki, E., Ntzoufras, S., Stathopoulou, E., and Telo, M. (2014). Sensponsive classrooms: Ambient Intelligent spaces that facilitate learning. In: K. Zreik (Ed.). Architecture, City and Information Design (EuropIA.14). Paris: Europia, 63-77. Oungrinis, K.-A., Liapi, M., & Mairopoulos, D. (2012). 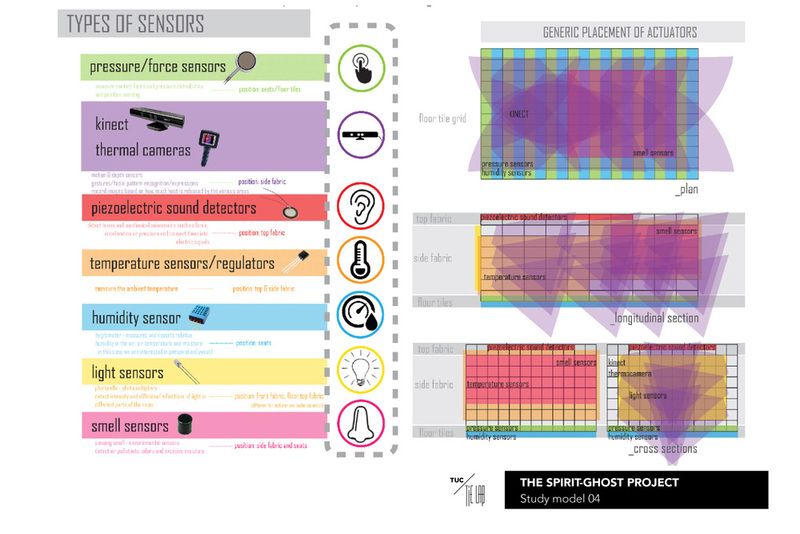 From analog, to digital, to analog, to… The seamless process of monitoring, understanding and affecting spatial arrangements in a responsive experiment called "Spirit|Ghost." In: C. Spiridonidis, & M. Voyatzaki (Eds. ), Proceedings of the EAAE/ENHSA International Conference: Scalelessseamless. Transactions on Architectural Education No 59. Thessaloniki: Charis Ltd, 197-207.